Stop-loss usage is an integral part of every profitable trading system. It is almost not possible to have a good money management system, without a risk management using stop levels. Many stock trading mistakes are connected to bad usage of a stop loss. Or entering a market trade without a stop loss. Such an approach to trading could lead to fatal losses. Almost an every trader that does not use a stop loss will fail sooner or later. He/She is going to experience major losses that wipe out his/her trading capital. And it is not possible to trade without money on a trading account. So it is not good to avoid stop loss orders in your system. It is also hard to recover from big losses. If you lose 50% of your account then it is necessary to make 100% to recover to zero level again. And it can be tough task if not impossible for some people. You have to set your stop level before you set your target! Immediately after your scanner finds a good opportunity for a trade setup and after you’ve defined your entry point, you must set your stop level point. This value has to fit with your maximum risk (i.e. max loss) for trade that you’ve defined in your stock trading strategy. 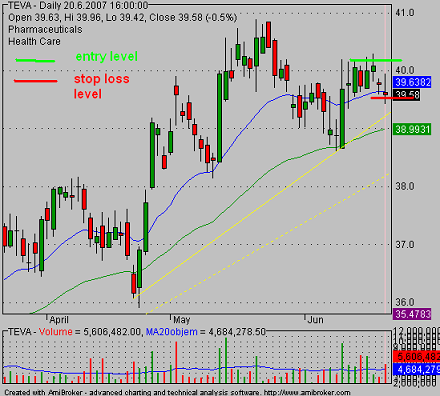 The risk (max loss) level has to be set under a logical support or above a resistance level. If you have a swing trade system, then your risk point for maximum loss should be closer to your entry point than for a position trade system. A setup for a day trading system must have a very narrow range between the entry point and the stop level. A risk (loss) value for a breakout trade doesn’t have to be very far from a broken support or resistance level. This will protect you in case of a failed break. You can use the same values you use to define the entry point. Define and use your stop-loss order for every trade you open!! Use a spreadsheet or other tool for preparing correct trade setup with all important info based on your risk management rules. You can also use charts of a lower, intra-day time frame like a 60-minute chart or a 4-hour chart that can be used to find a good intra-day support or resistance level for placing stops. When you enter a trade you must not forget that you have to take care of every trade. You should regularly monitor a situation, you must know how your trade develops and also you must have rules for a trade management. These rules should also include how do you trail a stop. All these steps should be accompanied in your daily routine.